• Numerous times over the past 34 years, Valley View Vaulters has earned the "Team High Point" Award in local American Vaulting Association, Region I Competitions. 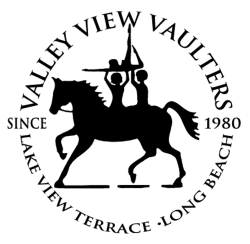 • Over the years Valley View Vaulters has been seen on TV and written up in many magazine and newspaper articles. Patrick McKnee even collaborated with Valley View Vaulters to make the multi-award winning documentary "Armed With Love" about Rick Hawthorne, one of the co-founders of Valley View Vaulters, and how he inspires so many through his love of equestrian vaulting. All 15 of our vaulters came back from Nationals with at least 2 ribbons! 4 Members of the Valley View Vaulters (Robin Wall, Sylvia Son, Rick Hawthorne, Virginia Hawthorne) receive awards for their ongoing support of vaulters of all ages and abilities. Mike Antonovich, Supervisor, 5th District, awards Valley View Vaulters the County of Los Angeles Commendation of "Recognition of dedicated service to the affairs of the community"
Los Angeles City awards Rick and Virginia Hawthorne the "Day of the Horse" Award. Wendy Gruel, Council member of the 2nd district, awards Valley View Vaulters the City of Los Angeles Recognition Award for "Special work with children of all ages and abilities on horseback through vaulting". • Los Angeles Board Supervisor Mike Antonovitch presented a Commemorative Scroll to each of our competitive team vaulters, due to their wonderful successes at the 1989, 1990, 1993, 1994 and 1996 National AHSA/AVA Vaulting Competition.